Jay Sterner Hammond (July 21, 1922 – August 2, 2005) was an American politician of the Republican Party who served as the fourth Governor of Alaska from 1974 to 1982. Hammond was born in Troy, New York and served as a Marine Corps fighter pilot in World War II with the Black Sheep Squadron. In 1946, he moved to Alaska where he worked as a bush pilot. Hammond served as a state representative from 1959 to 1965 and as a state senator from 1967 to 1973. From 1972 until 1974 he was the mayor of the Bristol Bay Borough. In 1974 he was elected governor of Alaska. He oversaw the creation of the Alaska Permanent Fund in 1976, which, since the early 1980s, has paid annual dividends to Alaska residents. From 1985 to 1992 he hosted a television series called Jay Hammond’s Alaska. He wrote three autobiographies. This article is a short introduction of his last book. Article 8, Section 8, of Alaska’s constitution states: “The legislature shall provide for the utilization, development, and conservation of all natural resources belonging to the state, including land and waters, for the maximum benefit of its people.” This clause prompted Hammond to attempt to assure that all Alaskans received a discernible share of those benefits and to avoid the common past practice of selectively benefiting the favored few at the expense of the many. This battle to avoid selective benefit still continues today. Before the permanent fund dividend, Hammond had tried several ways to comply with the mandate of the aforementioned constitution, but all fell flat. His first attempt was to abolish fish traps in the Bristol Bay Borough in 1965. A whopping 97 percent of the fishing payday made within the boundary went to others and local residents got but a paltry 3 percent! He proposed a use tax to be paid by all fishermen on their catch. To offset the impact on local fishermen already paying high property taxes, he proposed to putting tax money into a conservatively managed investment account, then each year issuing residents one new share of dividend-earning stock. He called the concept “Bristol Bay, Inc.” The word “tax” made most Alaskans oppose it. With passage of the Alaska Native Claim Settlement Act (ANCSA) in 1971, Alaska’s aboriginal peoples were accorded 44 million acres of land and $900 million by the U.S. Congress. Hammond proposed again to follow the Bristol Bay, Inc. model to manage ANSCA grants: create a conservatively managed investment account and spin off equal dividends to every Alaska Native. This account was proposed to be managed by professionals under counsel supplied from an elected advisory board of Natives representing every Native group in Alaska. People would have the opportunity to lift themselves up by being stockholders, providing themselves with the means (along with the responsibility) to use it for their collective best interests. Hammond’s proposal failed in the face of obstructions by lawyers, financially and politically powerful Natives, and other local forces. His third attempt was to assure that the more affluent rural areas with a sufficient tax base help fund government services the same way as urban centers are required to do. Under his proposed statewide property tax, affluent municipalities, such as the North Slope Borough with high oil property values, would have to assume more of their local government service costs than would those that were virtually destitute. That proposal also fell flat on its face. Unfortunately, inequitable taxation continues to contribute to Alaska’s urban/rural divide. In another effort to reduce crippling costs of services to hundreds of economically unviable communities – many of which were not connected by roads and lacked adequate housing, schooling, and basic services – he proposed to provide population centers with the greatest economic potential with topnotch schools and other services as a means to encourage migration from other communities. Once again the proposal fell flat. 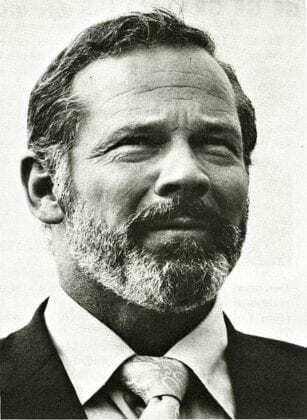 After becoming governor in 1974, he proposed that 50 percent of all mineral leases, bonuses, royalties, and severance taxes be deposited into a conservatively managed investment account. Each year one-half of the account’s earnings would be dispersed among Alaskan residents, each of whom would receive, annually, one share of dividend-earning stock. The other half of the earnings could be used for essential government services. To encourage contributions into the investment account and to protect against its invasion by politicians. To transform oil wells pumping oil for a finite period into money wells pumping money for infinity. To pit collective greed against selective greed. To eliminate the magnetic attraction for others from elsewhere who might otherwise be inclined to flock to Alaska in order to get big money in a short term. To instill a sense of ownership in all Alaskans that would incline them to support healthy resource development and resist unhealthy versions. To eliminate controversial state expenditures for such things as abortions. Individuals wishing an abortion could pay for it from their dividends. of legislators were successful in passing legislation creating what they termed “The Alaska Permanent Fund.” This statute at least created a semblance of Alaska, Inc., but fell far short of what Hammond had hoped for. For more detailed information about the book, please click here. Many thanks for Russell Ingram’s reviewing and editing. Furui Cheng has written 9 articles. Upon statehood in 1959, fish traps were outlawed. So you’re about a decade off. There are some polititions that really work hard for Alaskans …then their are the ones that strictly work for the state.